The Arizona State Flag has great sybolism. It is very simple. It carries thirteen stripes like Old Glory representing the original colonies of the USA. These stripes are red and yellow. The red is to honor the Spanish explorer Coronado for the red flag he carried. The yellow stripes are depicting rays of sunhine. The stripes depict a sunset type that is often seen in the monsoon months in Arizona. 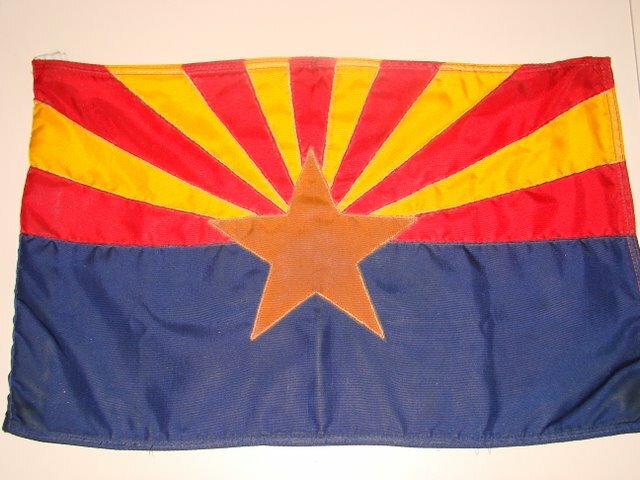 The Arizona Flag has has a copper star which symbolizes and commemorates the copper industry in Arizona. Arizona produces over 75% of the copper in the United States. The blue field is symbolic also of the same color of blue in the Country's flag. In the U. S. flag, stars are depicted to represent each state. Arizona's flag with its copper star also acknowledges being one of the stars represented for the 50 states. The theme is a sunset but it is much more than that.